[Editor’s note: Michael Clancy, a photojournalist hired by U.S.A. Today, has had a change of heart after taking this now famous photo of a prenatal surgery performed on Samuel Armas in utero. He is trying to reach others with this photo and would like to print the image on posters for donation to crisis pregnancy centres. He hopes to see it next on billboards. If you would like to help, visit his web site at www.michaelclancy.com. As a photojournalist, my job is to tell stories through pictures. The experience of taking this photograph has had a profound effect on me, and I’m proud to share this moment with you. The tension could be felt in the operating room as the surgery began. A typical C-section incision was made to access the uterus, which was then lifted out and laid at the junction of the mother’s thighs. The entire procedure would take place within the uterus, and no part of the child was to breach the surgical opening. 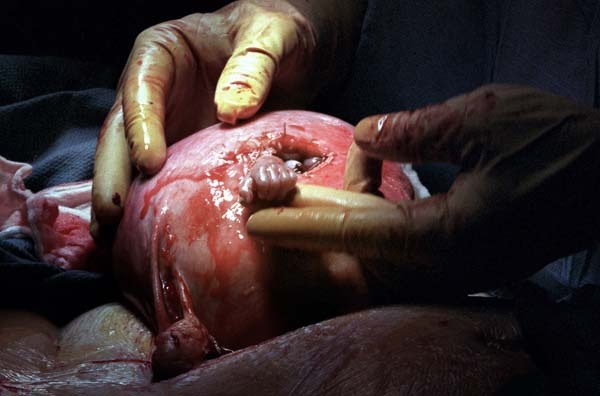 During the procedure, the position of the fetus was adjusted by gently manipulating the outside of the uterus. The entire surgical procedure on the child was completed in 1 hour and thirteen minutes. When it was over, the surgical team breathed a sigh of relief, as did I.